Last weekend I attended Book Bash 2014 in Orlando, FL and had the most AMAZING time ever!!! I got to meet some of my favorite authors, get my books signed and hang out with some truly awesome ladies!!! One of the big highlights from the weekend was ANGSTFEST!!! There was a ton of fun, singing, dancing and laughs to go around! If you're not familiar with "Maybe Someday" then you need to be!!! Maybe Someday is a book that was written by Colleen Hoover AND a soundtrack of songs written by Griffin Peterson to go along with the book. It's amazing and one of my favorites!!! I love it so much that I am GIVEAWAY!! To enter all you have to do is COMMENT on this blog post below. One random winner will be chosen from those who commented or Tweeted appropriate tweets on Twitter and announced on Sunday, July 27, 2014. 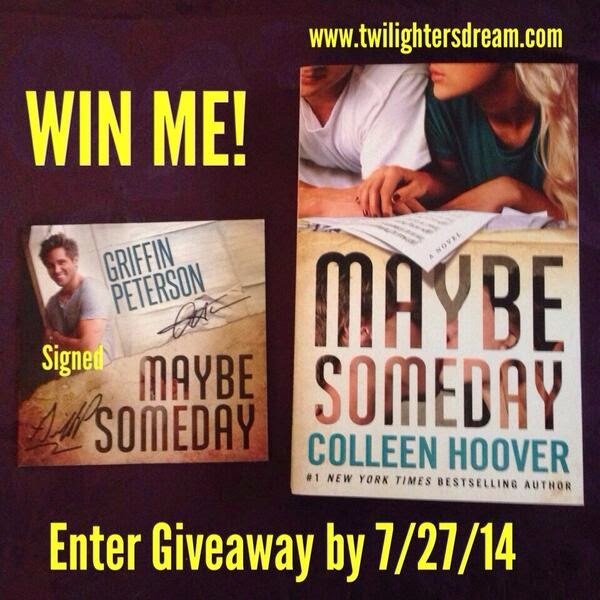 The Prize Pack includes (1) paperback copy of Maybe Someday by Colleen Hoover and (1) AUTOGRAPHED COPY of the Soundtrack signed by BOTH Colleen Hoover and Griffin Peterson!!! GIVEAWAY CLOSES AT 11:55 am on Sunday, July 27. Winner will be announced at 12:00 pm EST right here. On Sunday, July 27 everyone who commented on this blog post or RETWEETED the appropriate tweets Twitter received an entry for this giveaway. Each entry received a number and the Random.org generator chose the winner. 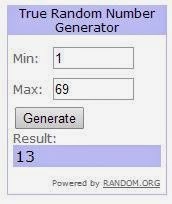 The lucky winner is entry Lucky #13. No joke! I literally laughed out loud when 13 popped up on the screen!! For all you Jamie McGuire fans you'll get the irony and chuckle in that!! Please email me at lisa@twilightersdream.com to claim your prize. Be sure to include your mailing address in the email so I can mail it to you. You have 48 hours to claim your prize. If you have not claimed it I will randomly select another winner. Thanks so much for the chance! Love to read but have not read this yet! 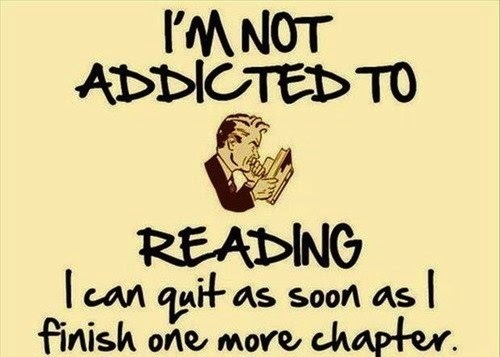 I'd love to read this. Awesome giveaway. What a great giveaway... Thanks for the chance! Omg lisa can't wait to see who get pick!!!!!!!!!!!! I haven't got to read this book yet and would love to. Thanks for the Giveaway :) and Congrats again! #macpack!! You are Awesome Lisa!!! Good luck everyone!!! 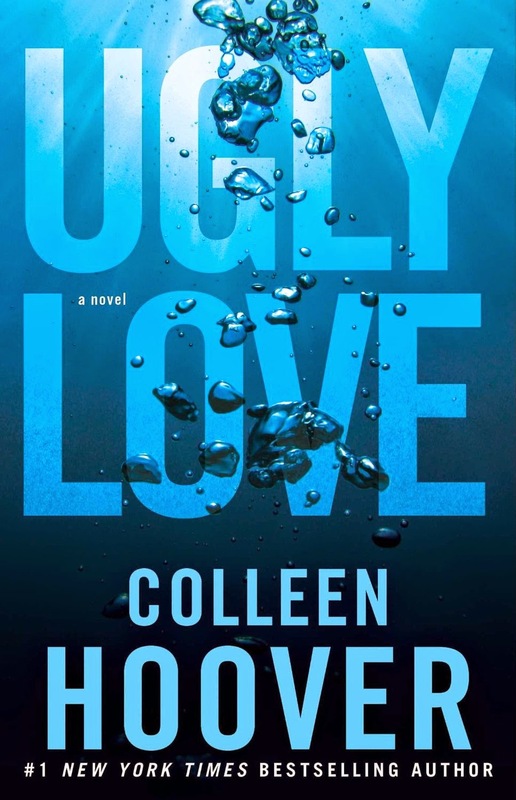 Colleen is my favorite author! I´ve just finished reading ¨Maybe someday¨ and I absolutely loved every single part of it. Now, having the chance to win this package, makes me want to run in circles. Ah!! I'm so thrilled! Thank you so much for the opportunity! I love Maybe Someday, Colleen and Griffin (in no particular order). Looks like you had an amazing time! Would love to make this my first read of yours! Good Luck Everyone! Thank you for the chance to win the Maybe Someday experience!! What a wonderful opportunity! Good luck everyone!! Book Bash was a lot of fun! Would love to win! Thank you so much for this awesome giveaway and this amazing chance to win! Maybe Someday has been on my tbr list for a while now, but unexpected medical bills have prevented me from buying any books :( Good luck to all who enter! Awesome giveaway, thanks for a chance to win! I would LOVE to win this! Book Bash was my first time hearing Griffin and the band so I would LOVE to own thay CD. I was too wrapped up in the fun to even think about getting a darn CD. (fangirl fail) If I don't get that CD soon I think I'll be 'in trouble trouble'! Yay awesome giveaway!!! <3 for my fellow macpacker!! You're awesome for giving this away! Thanks for the opportunity! !